2.5" Inlet & Outlet, one piece aluminum scoop. 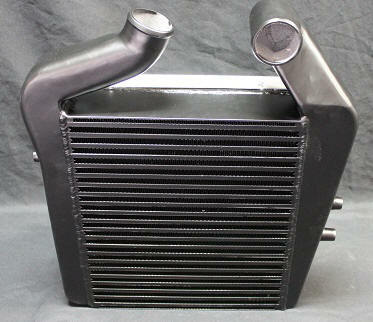 The intercooler hooks directly to your original up pipe and turbo just as the stock one does. The sizes of this unit are; 13.5" wide (just like the factory) 15.5" tall, and a 3" thick core with a 2.5" inlet and a 2.5" outlet. 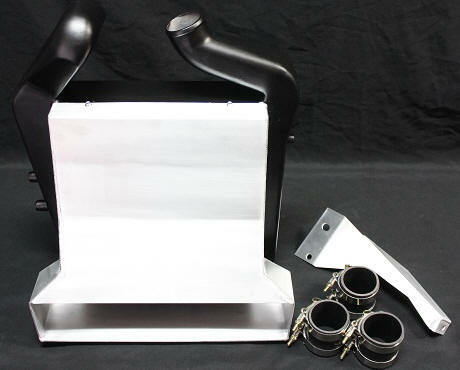 Also included in this kit are hoses, clamps and passenger side bracket. 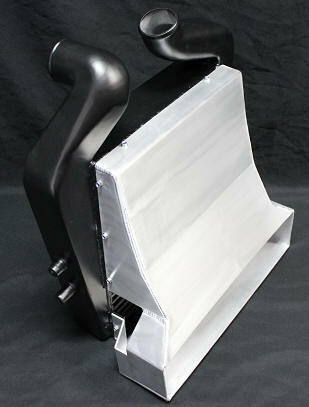 The stock driver side bracket will be reused. The size of the hoses are 2" x 2.5" for the IC inlet and two 2.5" hoses for the IC outlet and throttle body connections. Now comes in a powder coated black finish and one piece scoop. NOTE! This package deal comes with BLUE or BLACK hoses. Select the color you want from the drop down menu below. Not responsible if you select the wrong color. Hoses shipped will be for a stock throttle body and 2" turbo outlet unless otherwise requested.